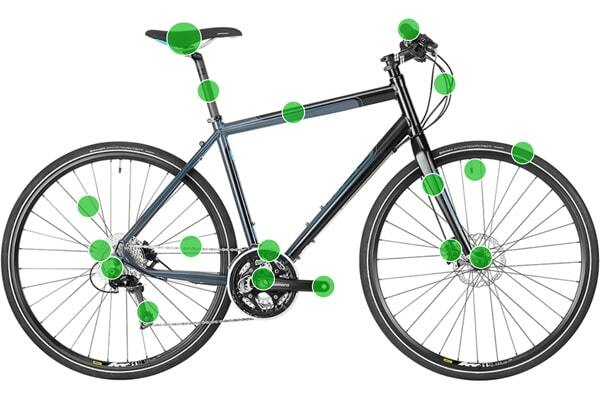 Did you know that you can check the health of your bearings by listening to your bike seat? Here’s a handy tip that will help you access whether or not any of your bearings are worn out. You’ll need to have the wheels suspended in the air somehow, using either a repair stand, hanging it from the roof, or by getting a friend to hold it up for you. You can listen to your bike by pressing your ear up to the front of the seat. It will act as a speaker, amplifying the bike’s internal noises. Now spin each of your components and listen to the sound. You will hear noise, but it should sound smooth and even. If it sounds loud and/or uneven, it is likely dry or worn out, and your bearings will need either an overhaul or complete replacement. When checking the bottom bracket bearings, it’s helpful to shift the smallest sprocket and remove the chain to eliminate the noise generated by the chain and chainring. To hear the rear wheel bearings better, remove the chain from the freewheel by removing and re-installing the wheel, so that you don’t hear the ticking as it spins around. Since the headset doesn’t spin around as fast, it’s more difficult to hear if it’s worn. Any dryness or wear in the headset bearings will be very obvious, and you’ll feel a notch in the rotation if they’re pitted. Pitting usually occurs when the front wheel is pointing directly forward. How to apply restore stickers and decals?